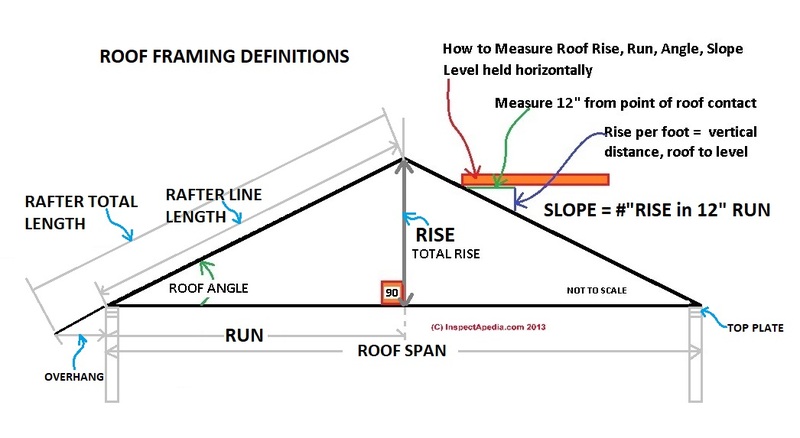 Roof Slope, Rise, Run, Definitions - How are roof rise, run, area or slope Defined? Roof slope specifications by roofing type. How are roof rise, run, area or slope Defined? Roof slope specifications by roofing type. 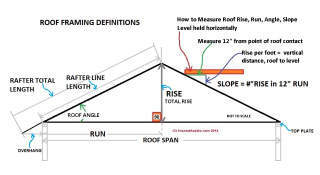 This article defines different types or degrees of roof slope and explains how roof slope, ptich, angle, or grade slope are measured & expressed. We give the required roof slopes for different types of roofing materials and we illustrate several methods by which the slope or pitch of a roof is easily measured. We also show how simple measurements can give the roof area without having to walk on the roof surface. We include simple calculations and also examples of using the Tangent function to tell us the roof slope or angle, the rise and run of a roof, the distance under the ridge to the attic floor, and how wide we can build an attic room and still have decent head-room. 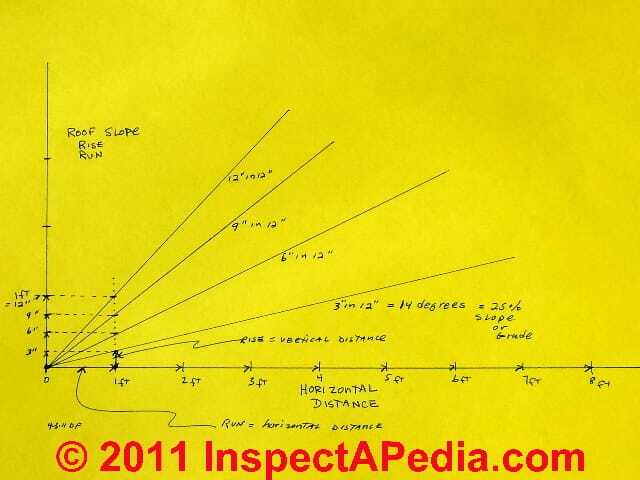 This article series gives clear examples just about every possible way to figure out any or all roof dimensions and measurements expressing the roof area, width, length, slope, rise, run, and unit rise in inches per foot. 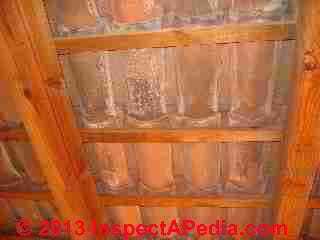 Our photo illustrates a roof whose slope has become irrelevant after the building collapsed. I suspect the roof in the photo was a bit steeper before the building fell in. The illustration at page top and used again below, courtesy of Carson Dunlop & Associates, summarizes the ranges of roof pitch or slope for flat, low-slope or conventional or "steep slope" roofing. What is the Difference in Slope Between Low Slope & Flat Slope Roofs? Actually most flat roofs are not dead flat and in good design also include slope towards their drains. Flat roofs (0" to 2" in slope) are flatter than low sloped roofs and pitch just enough to drain water. 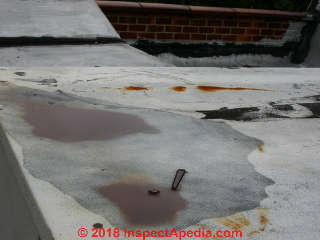 In our photo below the roof slopes less than 1" per foot - notice the two areas of ponding and staining on this roof. What is the definition of roof slope and how are rise, run, slope, angle and percent slope related? Roof pitch or slope is the angle of the roof surface above the "flat" or horizontal plane. Roofers express roof slope as "rise" or "pitch", measured in inches of vertical rise per foot of horizontal distance or "run". So a 3-inch rise roof, also described as a 3 in 12 roof, means that for every 12" (or foot) of horizontal distance, the height of the roof increases by 3". Our sketch above shows the relationship between horizontal distance or "run" and roof slope or "rise". While roof slope is typically expressed in "rise", it can also be expressed in degrees or in percent of slope. A 3-in-12 roof rises 3" for every 12" of run. That's the same as a 14 degree slope, or a 25 % slope. Why is the roof slope 25%? 3" of rise per 12" of run is the same as 1" of rise per 4" of run or 1/4 = 25%. Definition of Run: the horizontal change in distance or the horizontal distance covered by an un-supported rafter or truss. Rafter run: the horizontal or level distance covered by the rafter - the bottom chord or base of a right triangle. In our sketch above the rafter run is shown as RUN under the left half of the roof. Definition of Rafter Span: the un-supported length of the rafter along its slope - the diagonal or hypotenuse of a right triangle. In our sketch the "rafter span" is referred to as the RAFTER LINE LENGTH. Definition of Roof Span: normally a roof span is the same as the building width between the outer edges of the wall top plates. Definition of Rise: the vertical change in height per unit of horizontal distance or run. Unit rise is a is a snonym for slope or roof slope. For example a 3/12 roof has a unit rise of 3" of height increase or rise per 12" of horizontal run or distance. Many framers use "rise" and "slope" interchangeably, calling a 3/12 rise roof a 3/12 slope roof. Definition of Roof Slope: roof slope is the amount of (vertical) change in height as a ratio of horizontal distance traveled, also expressed as inches of rise per foot of horizontal run, or cm of rise per m of horizontal run. typically in construction we express roof slopes as units of rise per single unit of run, such as 3 inches of rise per 12 inches of run or 3" per ft.
Also see ROOF SLOPE TABLE, TYPES, WALKABILITY for a guide to roof slopes versus walk-ability versus roof type and for an explanation of the roof slope ranges that define the catetories of "low slope" and "steep slope" roofs. Steep slope roofing is defined as any roof pitched greater than 3 in 12 or 14 degrees or 25%. Roof slope affects roof life (steeper roofs drain better so may be more leak resistant), as well as roof installation cost (steeper roofs are harder or even impossible to walk-on without using roof jacks or scaffolding, increasing labor costs to install roofing). 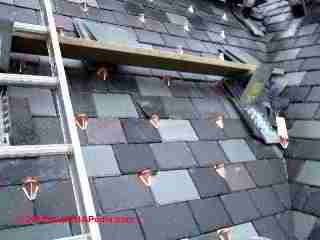 Our photo (above-left) shows a steep slope slate roof. You can see by eye that this is certainly more than 3" of rise for every foot of horizontal distance or run of the roof slope, and you'll also see that the slate roofers were using roof jacks to work on the roof surface. also see MODIFIED BITUMEN ROOFING for examples of low-slope roofing designs & materials. Flat roofing is roughly horizontal or "flat" but in fact very few "flat" roofs are really flat, either because it is difficult to build a dead flat surface over a building, or more importantly because even "flat" roofs need to drain water to avoid ponding and leaks. So most "flat" roofs have at least a little slope either towards one or more roof edges or towards roof drains. So "flat" roofs are really "low-slope" roofs most of the time. To avoid ponding and leaks, flat roofs typically have a nominal drainage slope of 2% to 4%. What are the Minimum Slope Requirement for Metal Roofs? Most metal roofing systems can be installed on slopes of 3:12 and greater and standing-seam systems from 2:12 and greater. Special standing-seam systems designed for slopes as shallow as 1/2 :12 require field crimping machinery and have sealant in all seams. The height of the ribs at seams and whether they are protected with a sealant affect how weathertight a roof will be under extreme weather. Clay roofing tiles are installed on slopes as low as 4/12, restricted to 6/12 in some jurisdictions. 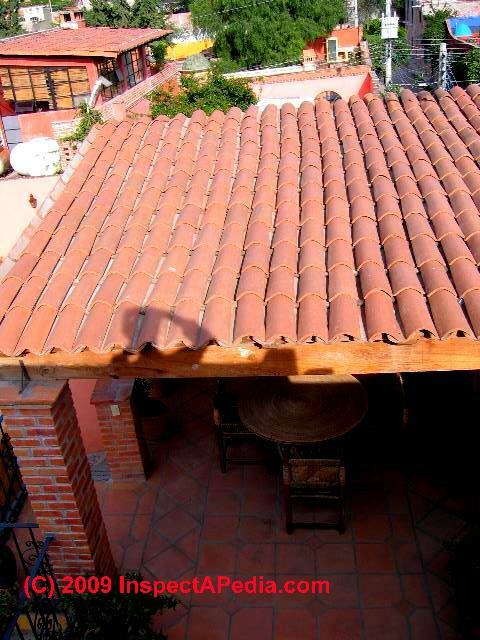 Our photo (above left) shows a low slope clay tile roof in San Miguel de Allende, Mexico. 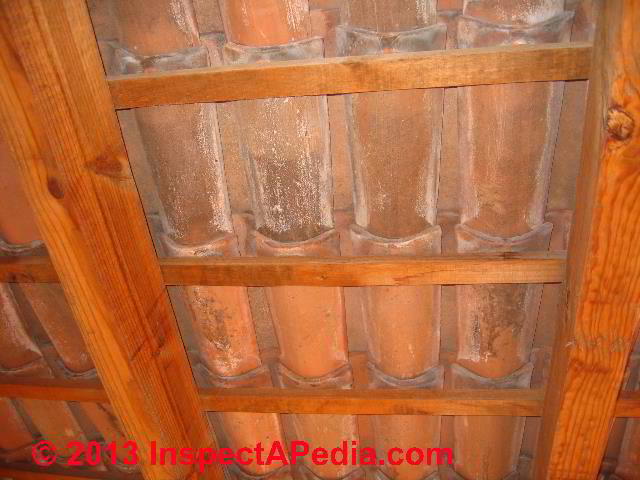 This roof was built without sufficient pitch (about 2/12) and it leaks badly during heavy rains, as you can see by our photograph of the roof's under-side (above right). Raising the high end of this shed roof a few inches will improve the roof drainage and stop the leak problem. Where clay tiles are installed on low slope roofs (less than 4/12) for aesthetic reasons, install a waterproof membrane on the roof surface below the tiles. Continue reading at STAIR RISE & RUN CALCULATIONS or select a topic from closely-related articles below, or see our complete INDEX to RELATED ARTICLES below. 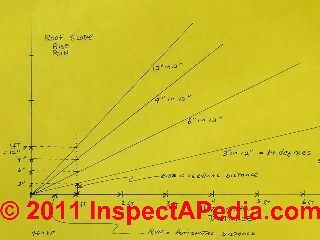 ROOF SLOPE DEFINITIONS at InspectApedia.com - online encyclopedia of building & environmental inspection, testing, diagnosis, repair, & problem prevention advice. Focus, Toledo, Ohio, Owens-Corning Fiberglas Corporation, October 1988. "A History of Innovation," http://www.owenscorning.com, 1997. Stewart, Thomas A., "Owens-Corning: Back from the Dead," Fortune, May 26, 1997.
International Directory of Company Histories, Vol. 20. St. James Press, 1998. The Journal of Light Construction has generously given reprint permission to InspectAPedia.com for this article. All rights and contents are ©Journal of Light Construction and may not be reproduced in any form. Green Roof Plants: A Resource and Planting Guide, Edmund C. Snodgrass, Lucie L. Snodgrass, Timber Press, Incorporated, 2006, ISBN-10: 0881927872, ISBN-13: 978-0881927870. The text covers moisture needs, heat tolerance, hardiness, bloom color, foliage characteristics, and height of 350 species and cultivars. Handbook of Building Crafts in Conservation, Jack Bower, Ed., Van Nostrand Reinhold Company, NY 1981 ISBN 0-442-2135-3 Library of Congress Catalog Card Nr. 81-50643. If you have never fixed a roof tile or slate before but have wondered how to go about repairing or replacing them, then this is the book for you. Many of the technical books about roof tiling and slating are rather vague and conveniently ignore some of the trickier problems and how they can be resolved. In Roof Tiling and Slating, the author rejects this cautious approach. Kevin Taylor uses both his extensive knowledge of the trade and his ability to explain the subject in easily understandable terms, to demonstrate how to carry out the work safely to a high standard, using tried and tested methods. This clay roof tile guide considers the various types of tiles, slates, and roofing materials on the market as well as their uses, how to estimate the required quantities, and where to buy them. 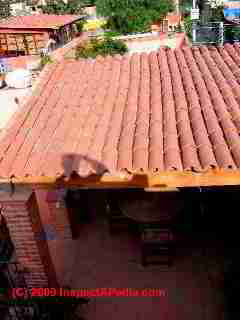 It also discusses how to check and assess a roof and how to identify and rectify problems; describes how to efficiently "set out" roofs from small, simple jobs to larger and more complicated projects, thus making the work quicker, simpler, and neater; examines the correct and the incorrect ways of installing background materials such as underlay, battens, and valley liners; explains how to install interlocking tiles, plain tiles, and artificial and natural slates; covers both modern and traditional methods and skills, including cutting materials by hand without the assistance of power tools; and provides invaluable guidance on repairs and maintenance issues, and highlights common mistakes and how they can be avoided. The author, Kevin Taylor, works for the National Federation of Roofing Contractors as a technical manager presenting technical advice and providing education and training for young roofers. The Slate Roof Bible, Joseph Jenkins, www.jenkinsslate.com, 143 Forest Lane, PO Box 607, Grove City, PA 16127 - 866-641-7141 (We recommend this book).